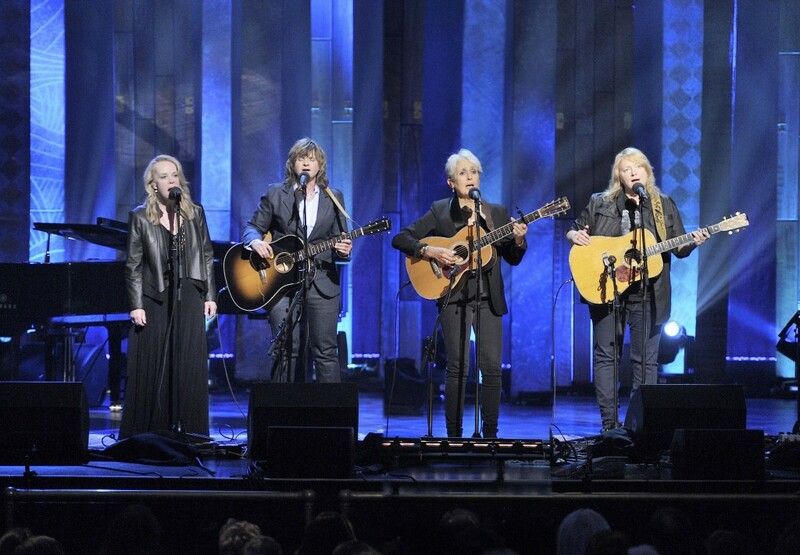 Legendary artists and longtime friends Joan Baez, Mary Chapin Carpenter, Amy Ray and Emily Saliers will share the stage in a special group performance as Four Voices in June. These exclusive summer tour dates will include stops at Nashville’s historic Ryman Auditorium, Chicago’s Chicago Theatre and Toronto’s Massey Hall among many others. Tickets go on-sale beginning the week of February 20 (check individual venues for details). See below for a complete tour itinerary. The friendship between these four acclaimed artists began over twenty-five years ago when Baez invited Ray and Saliers to perform at a 1991 benefit at the Berkeley Community Theater for her human rights organization, Humanitas. Upon accepting the invitation, Ray and Saliers suggested enlisting Carpenter as well. After a successful performance, the four of them reconnected a year later at an Earth Day Celebration in Boston and at the Newport Folk Festival. Most recently, while together at Baez’s 75th birthday concert at the Beacon Theatre, they discussed the possibility of going on tour together and—one year later—the Four Voices Tour was confirmed. Baez’s career has spanned over 50 years during which she unselfconsciously introduced Bob Dylan to the world in 1963, marched on the front lines of the Civil Rights movement with Martin Luther King, inspired Vaclav Havel to fight for a Czech Republic and continues to this day to stand passionately on behalf of causes she embraces. She is the recipient of many honors including the Recording Academy’s Lifetime Achievement Award as well as Amnesty International’s Ambassador of Conscience award and, in April, will be inducted into the Rock & Roll Hall of Fame. Her early albums introduced songs that found their way into the rock vernacular including “House Of the Rising Sun” (The Animals), “John Riley” (The Byrds) and “Babe, I’m Gonna Leave You” (Led Zeppelin). Over the course of her acclaimed career, Carpenter has recorded 14 albums and sold over 14 million records. Beloved by fans and critics alike, she has won five Grammy Awards (with 15 nominations) and is a member of the Nashville Songwriters Hall of Fame. Her most recent album, The Things That We Are Made Of, was produced by Grammy Award-winning producer Dave Cobb and was released last year to widespread acclaim. The Associated Press calls it, “…an evocative collection of songs,” while The Huffington Post declares, “…Carpenter is now at the height of her musical career, painting a compelling, relevant piece of art tinged with mixed feelings of grief and joy, all without preaching or darkening our minds with sadness.” Previously, in 2014, Carpenter released her debut orchestral album, Songs From The Movie, which was arranged and co-produced by six-time Grammy winner Vince Mendoza. Since it’s release, Carpenter has performed alongside the New York Philharmonic, the BBC Scottish Symphony Orchestra, the London Concert Orchestra, the L.A. Philharmonic and the National Symphony Orchestra among many others. Twenty years after they began releasing records as the Indigo Girls, Grammy award winning musicians Amy Ray and Emily Saliers have politely declined the opportunity to slow down. With a legacy of releases and countless U.S. and international tours behind them, the Indigo Girls have forged their own way in the music business. Selling over 15 million records, they are still going strong. Amy & Emily are the only duo with top 40 titles on the Billboard 200 in the ‘80s, ‘90s, ‘00s and ‘10. The duo has balanced their long, successful musical career by supporting numerous social causes – the Indigo Girls don’t just talk the talk; they walk the walk. Having established an intensely dedicated fan base, the duo continues to remain relevant and attract new fans. In 2015 Indigo Girls released their 16th studio album, One Lost Day, and have toured extensively as an acoustic duo, with their full band and with dozens of esteemed orchestras in major cities across the country. at Sacks & Co., asha.goodman@sacksco.com, louis.dadamio@sacksco.com or carla@sacksco.com.